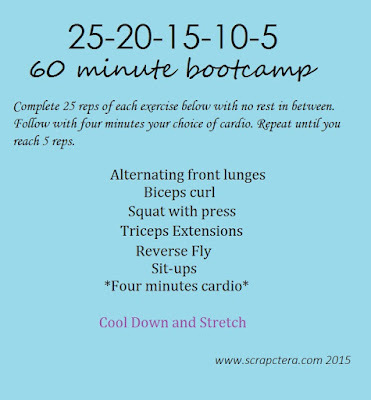 Taught this one tonight and it is guaranteed to make you sweat! Go all out on the cardio so your heart gets up. You can do four minutes straight (running, jogging, jump rope, etc) or mix it up with burpees, squat jacks and side shuffles like we did. Start the first sets with a light to medium weight and then try to go heavier at the end. If there's one thing I love it's clothes! Unfortunately I never have time to go buy clothes anymore. It seems like I am always on a "tight" schedule of running kids here and there in between work and teaching at the health club. One day a friend was wearing a cute top and I asked here where she got it. She told me Stitch Fix. I order it online and they send you a box with clothes in it. 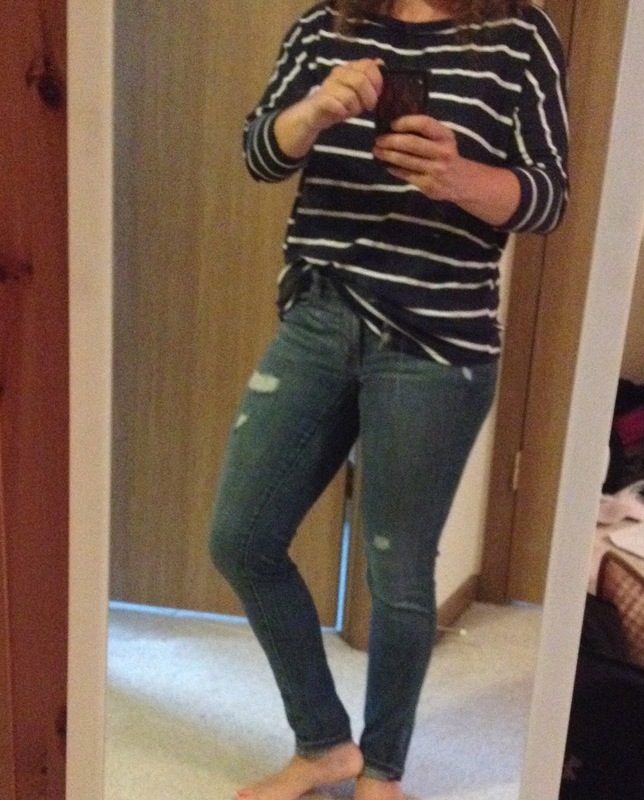 Hmmm, what is this stitch fix you talk about? I was interested. I listened to her explain it and then went online to see for myself. the idea of having a mystery box of clothes sent to me was intriguing and sounded like so much fun. I decided to give it a try. The first step is to sign up for an account. When you sign up you will be assigned a stylist that picks out your items based on the criteria you provide. There is also a $20.00 styling fee that is applied to any items you purchase. You pay the styling fee up front. You can purchase all five items (you get a 25% discount if you do) or you can send them all back in a prepaid envelope. If you don't purchase anything then you loose your $20.00 styling fee though. There are no shipping charges and I figured I would like at least one thing in my shipment so I decided to give it a try. You can choose when and how many fixes you want delivered. There's a one time choice, every month or bi-monthly. I signed up for bi-monthly. Every fix will come with five items, either accessories or clothing. You choose what your sizes are, how much you want to spend on items and if there's anything you absolutely don't want (I put earrings and fur). Then you rate some clothing on how much you like each outfit. There's a box at the bottom to write a message to your stylist. I told my stylist I like bright colors and patterns and I am extremely short so finding bottoms that are the right length is a challenge. Then you sit and wait for your box to arrive! Or least that's what I thought! I was told if you create a pinterest board and share it with your stylist (there is a link for it on your profile) she will have a better idea of what you like and better be able to pick things for you. So I started pinning like crazy! I pinned so many cute things and got even more excited for that box to come! A couple of days later this was on my doorstep! The first thing I looked at was the styling card that is included in your box. Hmmm, I was a little disappointed. Where were all those cute tops I saw on pinterest? And I told my stylist I liked bright colors and fun patterns. I only started pinning a couple weeks before my box arrived so maybe I started too late? I looked over the styling cards and read the message from my stylist then took everything out to try on. I loved it! But it is summer. IN CHICAGO. WHICH MEANS IT'S LIKE 90 DEGREES. And I have about 10 other shirts that look just like it. The whole reason I wanted to try stitch fix was to try fun things I wouldn't normally buy. So I tried it on. And it was long. I mean almost to my knees long. Curse my shortness! But I remembered seeing a post about the new messy tuck. Grab a side of your shirt and tuck in at one side belt loop. Cuter! Verdict: I kept it! I loved it and could picture myself wearing it all the time. I would never, and I mean never pick this out for myself in the store. It has buckles and zippers and that pointy collar, but for some reasons I am obsessed with it! It fit perfect and I love the color as it will match with almost anything. Again it screams fall to me. The styling card did have it with summer outfits though. Maybe for the cooler nights? Here it is with the Dolman top. Verdict: I kept it. it's a little more expensive that something I would usually buy, but I liked that I wouldn't pick it out for myself. I immediately did not like this blouse. I thought the price was too high for it and did not like the pattern at all. I reminds me of a uniform from Walt Disney World (and that's just my opinion so if you love it, great!, it's just not for me). When I tried it on it was huge as well. Big and shapeless. Verdict: Sent back. It was too big, too expensive and I wasn't crazy about the pattern. I liked it when I took it out of the box. But when I tried it on I wasn't too crazy about it. It looked cute in the front with the tie, but bunched weird in the back. It was also super thin and see through so would have to wear something under it. I am also not a big fan of black and white. Oh my goodness so cute! I love the color, I love the style. It looked so cute on the style card with the sleeves rolled up! Unfortunately it was also huge on me. I was so sad. It was the only thing in the box with the bright color I wanted. 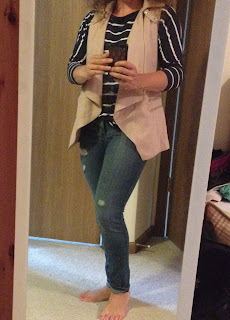 Overall review- It was so fun to receive these clothes in the mail and try them all on. 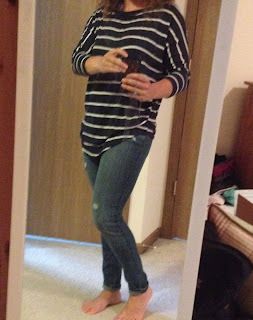 I was hoping for some fun summer tops and am kind of bummed the two things I did end up keeping I will probably wear more in the fall. I did tell my stylist fun bright colors and patterns! Was she not listening!?!? I am going to try it again. It was fun! What can I say? When you decide what you want to keep and send back you go online to check out and they charge your credit card. You can rate each item and provide feedback for each item. Whatever you are sending back you put in the prepaid envelope to send back. I have heard the more you pin to your pinterest board and the more you tell your stylist about each item (why you love it, hate it, etc) the better the choices will be in the next few boxes. So yes I will try it again and I'll let you know how my next box turns out! If you try Stitch Fix or have a subscription let me know what you think! All good things, all good things and.... Frozen birthday invitations! I can't believe how fast time is moving and can it possibly be two years since I last updated this blog? As my girls are growing my life keeps getting more and more hectic! I needed to create an excel spreadsheet just to figure out who was picking my daughter up from school each day (and I am not exaggerating!) I wouldn't trade any minute of it, but I do wish my little girls would stay this cute and sweet for just a little while longer! Although I haven't been doing much traditional scrapbooking lately I have been doing lots of other things I am excited to share with you! Let's see- I have been doing lots of decorating and home decor projects that I can't wait to share with you. After I got my fitness certification I started teaching classes at some gyms in my town. I will be sharing lots of cycling workouts and fitness classes for you soon. 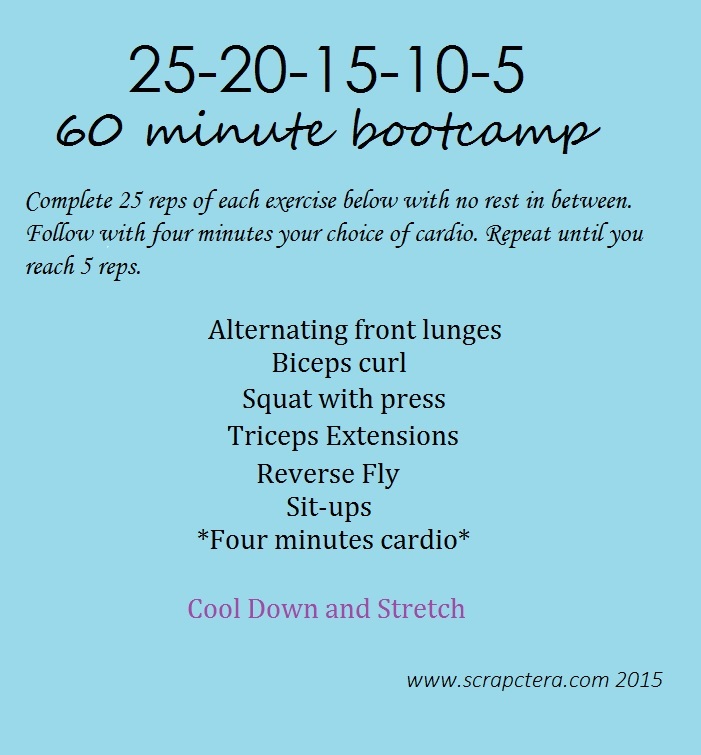 I am so excited to share these with you and motivate you reach all your fitness goals! I have been teaching at my actual job (yes, I sometimes say work gets in the way of everything I want to do, but I wouldn't trade my teaching job for anything) teaching high school science. 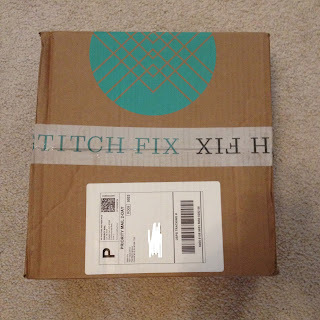 I started a stitch fix subscription! I couldn't wait to start this fun subscription. 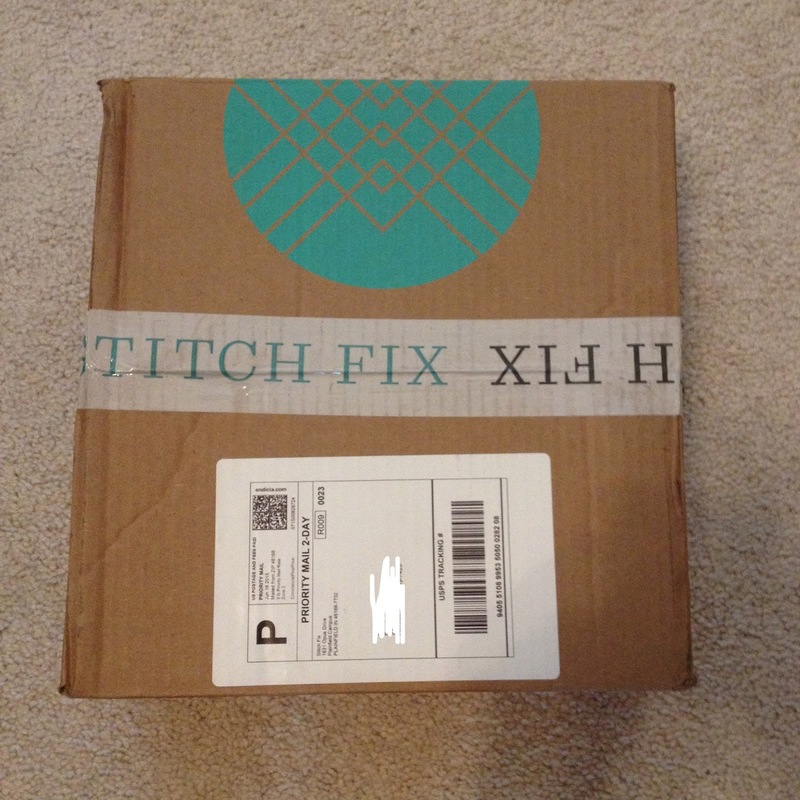 If you are unfamiliar with stitch fix it is a clothing subscription service. You go to their website and fill out a style profile. Then a stylist is assigned to you and sends you five pieces she thinks you may like. You can order just once or set up your subscription to be delivered as many times as you like. Anything you don't like you send back. I just LOVE clothes and what's better than getting a fun mystery box of new clothes to try on????? There's a little more to it than that, but I will update you on all the details when I review my first shipment next week. And I have been doing all the other fun mom stuff moms do! Today I have some Frozen birthday invitations that I created for my daughters' birthday parties. Yes that is daughters plural. 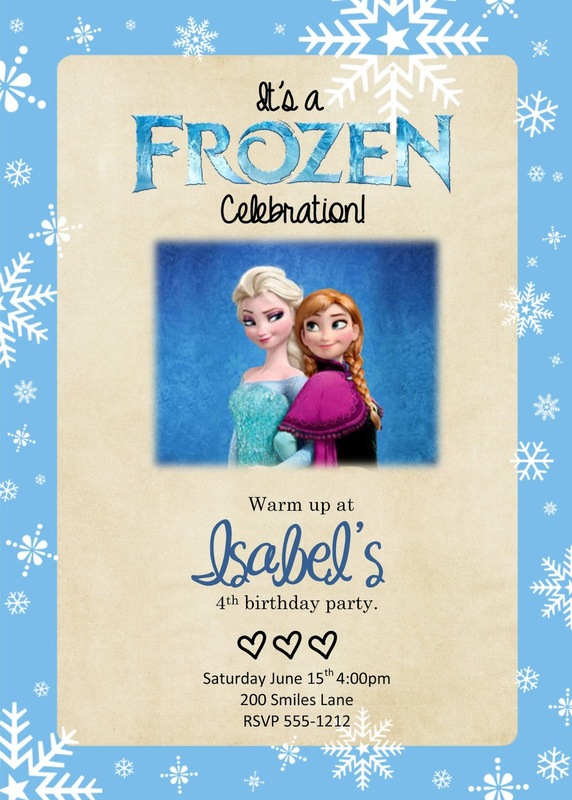 Both wanted a Frozen party of course! Here a couple of different inviations I came up with. 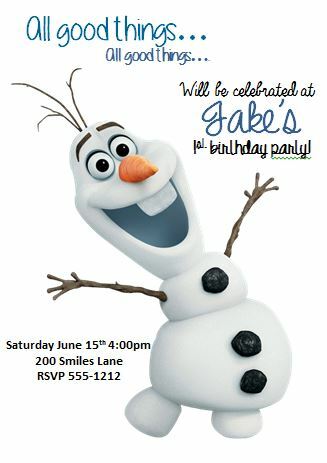 Who doesn't love Olaf? Especially in summer????? And here's the sisters!!! My girls always fight over who should be Elsa. Personally I like Anna better. She's the heroine of the story! You can find these invitations and more on ETSY. I can create any personalized theme. Just let me know if there is something you are looking for.